Gov. Tom Corbett and First Lady Susan Corbett interact with the audience during a brief stop in Birmingham Township Friday morning. A cozy room, roaring fire and predominantly female partisan crowd greeted Gov. 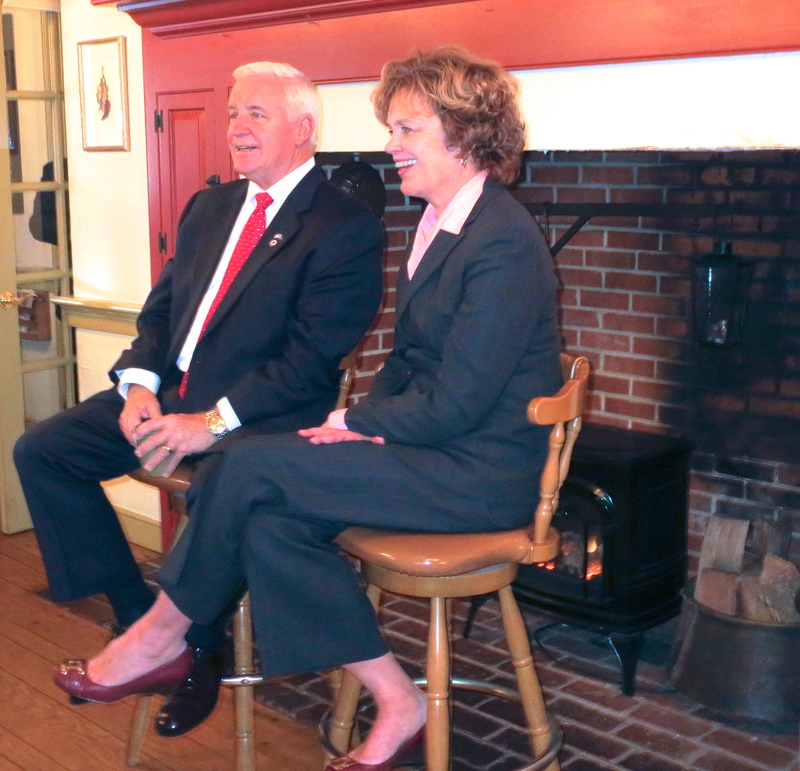 Corbett and his wife, Susan, when they visited Birmingham Township Friday morning, part of the kick-off to his reelection bid. 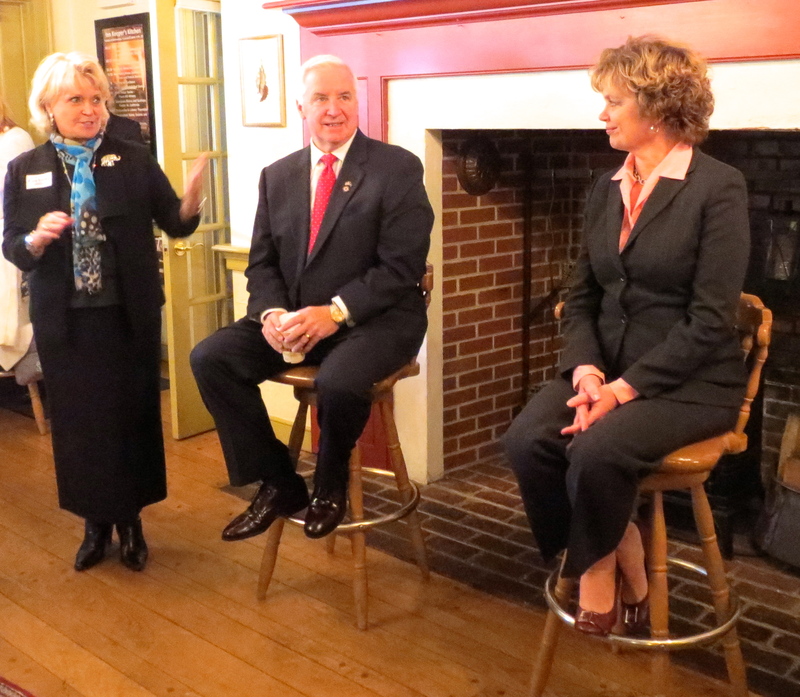 Corbett’s approximately hour-long stop at the Inn Keeper’s Kitchen in Dilworthtown was organized by Chester County Sheriff Carolyn “Bunny” Welsh, who said she enjoyed the chance to gather about 40 “accomplished women” to hear the governor’s message. Even better, Welsh said, was the opportunity to introduce Susan Corbett and the important work she has been doing for education, a sentiment echoed by another speaker, Bernadette S. Comfort, executive director of Anne B. Anstine Excellence in Public Service Series, a professional leadership program. Susan Corbett said she is particularly excited about the “Opening Doors” initiative, a program aiming to increase Pennsylvania’s graduation rate by identifying at-risk, middle-school students. The program, which grew out of forums with educational leaders from across the state, will use web-based indicators to help educators identify students who could benefit from intervention resources, she said. As Gov. Tom Corbett listens, Chester County Sheriff Carolyn “Bunny” Welsh (left) introduces First Lady Susan Corbett to a group of supporters at the Inn Keeper’s Kitchen. Gov. Corbett agreed, pointing out that their shared interest in education dates back to 1972 when she made $6,600 a year as a teacher and he made $6,000. He said critics are misinformed when they claim he doesn’t understand education. He said his wife continued to be the family bread-winner when he decided to pursue law school. It has been 45 years since their first date – Oct. 5, 1968 – and they will celebrate their 41st anniversary this year, he said. “I couldn’t ask for a better partner; I couldn’t ask for a better wife,” he said, calling her his conscience and the one who cautions, “Hey, don’t say that.” He suggested that said she is one of about five women “who tell me what to do.” Among them: his chief of staff, Leslie Gromis Baker, who he believes is the first female to hold that role in the history of the commonwealth. He said he decided to run for governor because “I felt I had more to give.” He said his often thinks about his grandson, Liam, and other youngsters like him who deserve a better future than one plagued by transportation and pension crises. Bottom line: He wants more time to fix those problems. The event, sandwiched between a breakfast in Malvern and lunch in Media, afforded only a limited opportunity for questions. Asked about gay marriage, Corbett said his personal view is that “marriage is between a man and a woman,” but he said if the law were changed in Pennsylvania, he would follow it. Would he consider cutting funds that go to Planned Parenthood that would be used for abortions? “We’re going to follow the law,” he said again, adding that he believes most of that funding is federal. Corbett might have been pressed on that subject from a more hostile crowd if a protest had materialized. A young woman from New Jersey reportedly asked one of the deputy sheriffs if she was in the wrong place for a Planned Parenthood demonstration timed to coincide with the gathering. He said that based on her email, she was in the right spot, but she left quickly when no one else showed up, telling the deputy that her mother didn’t know she had taken the car.